Might Platelet Rich Plasma Postpone a Knee Replacement? Centrifugal force is used to create platelet-rich plasma. Solid blood elements (white blood cells, red blood cells, and platelets) are separated via centrifugation due to variations in size and density. Can Platelet-Rich Plasma Ease the Pain of Osteoarthritis? CHICAGO—For years, doctors have used platelet-rich plasma, or PRP, to promote healing after surgery. Now, Rush University Medical Center is studying whether PRP can help relieve knee pain in patients with mild to moderate osteoarthritis. PRP contains growth factors that promote cell proliferation and is prepared from the patient’s own blood tissue. It has received popular attention because of its use in treating sports injuries in professional athletes, but the jury is still out on whether it is effective. The therapy will not be a cure for osteoarthritis, but it could help put off the day when a patient will need to get a knee implant. At present, the standard of care is either corticosteroid injections, which may last about three months, or synthetic lubricants containing hyaluronic acid, which can last for up to a year. In the double-blind, randomized, controlled study, 100 patients will receive either hyaluronic acid or PRP. 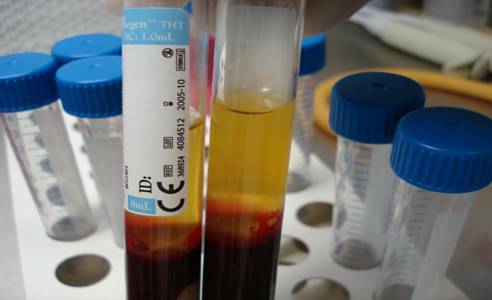 The PRP is prepared from 10 millimeters of the patient’s own blood. The blood is spun in a centrifuge to separate the platelets from the red and white blood cells. The platelets are then injected into the knee joint using ultrasound imaging to guide placement.